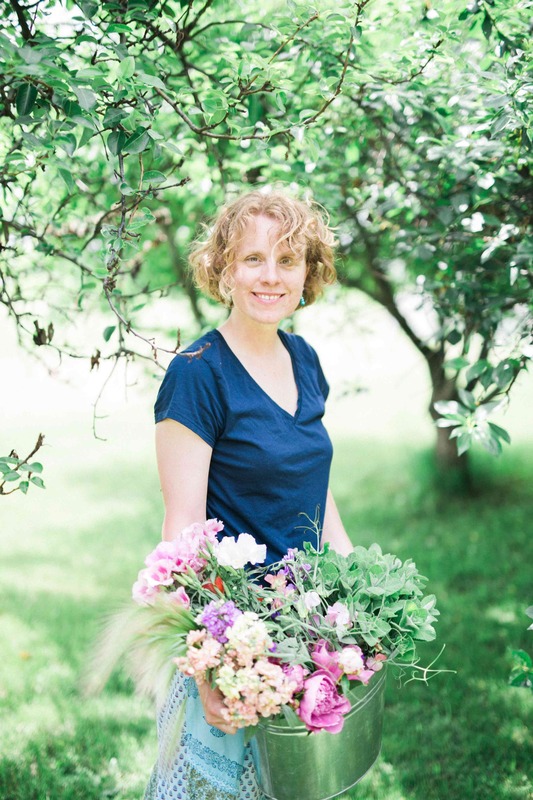 Emily Watson, Milwaukee, Wisconsin-based flower farmer, floral designer, entrepreneur — today’s podcast guest. I first met today’s guest “virtually,” when I reached out to her asking permission to use a portion of a online discussion she had started with other flower farmers. 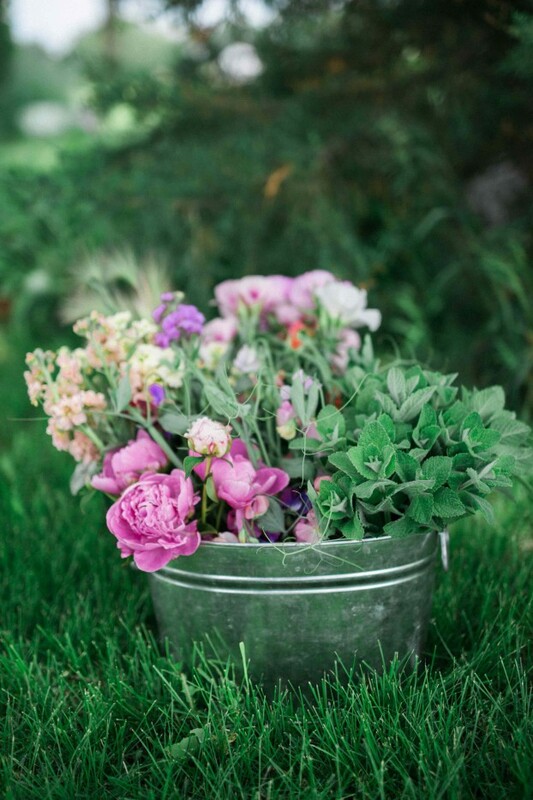 Emily Watson is based in Milwaukee, Wisconsin, and since 2008 she has owned Stems Cut Flowers, a specialty cut flower business based on her grandparents’ farm about 45 minutes west of Milwaukee. She is a founding member of Slowflowers.com, having supported our launch by contributing to the initial Indiegogo campaign. Emily and I finally met in person last October at the ASCFG national meeting in Wilmington, Delaware, and that was when we spoke further about the possible “course-correction” she was considering as she juggled flower farming and a successful floral design aspect to her business. Recently we connected over Skype for a conversation that I believe you’ll find quite honest and forthcoming. The responses Emily received were encouraging and honest; no one tried to sugarcoat the truth about the backbreaking reality of running a small farm. They also revealed that people do not grow and market flowers because it’s lucrative, but at least in part for a love of the land and a passion for the independent lifestyle it brings. Emily’s tagline for Wood Violet, her new design studio, is “floral design inspired by nature.” How fitting! 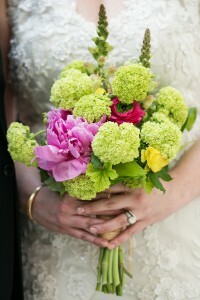 A May wedding bouquet grown and designed by Emily Watson. She grew up in a small agricultural town not terribly far from Milwaukee with three brothers and lots of cousins nearby, playing outside all the time. After high school, Emily attended the University of Wisconsin in Madison where that love for the natural world led her to earn a bachelor’s degree in Biological Aspects of Conservation. She worked as a landscaper, which led to work in a flower shop, which somehow led to managing a Chinese restaurant. As she puts it: “I learned a lot about business at that Chinese restaurant and made a lot of friends, but the call of the outdoors was too strong. By 2008, Emily had started Stems Cut Flowers at her grandparents farm in East Troy, the town in which she grew up. 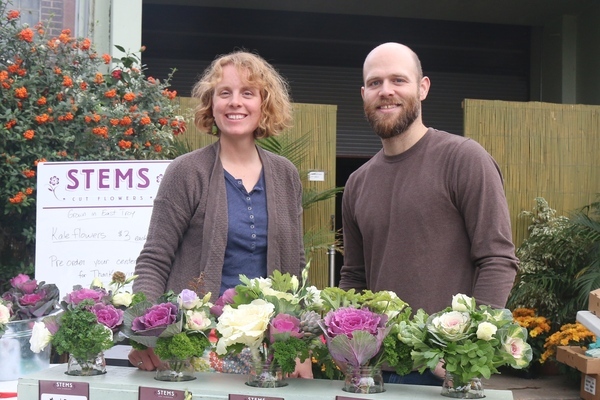 As a small farming business, Stems flourished into a floral design business. Emily considers herself lucky enough to live in the city and spend a few days every week at the farm, the best of both worlds. Spring flowers in a romantic nature-inspired bouquet. Her intention has always been to run a thriving flower farm that sells its crops to florists and to the public at farmer’s markets, picking up occasional wedding design work. 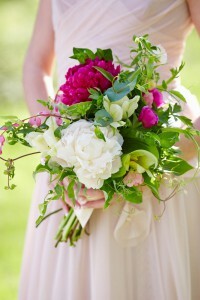 The reality, however, is that the idea of “occasional” wedding design has turned into a nearly every weekend occurrence. It soon became evident to Emily that she was running two separate businesses. Last year she decided to create a separate identity for the design portion of her business. The timing is perfect for today’s interview because Emily is in the midst of launching a floral design studio in Milwaukee. 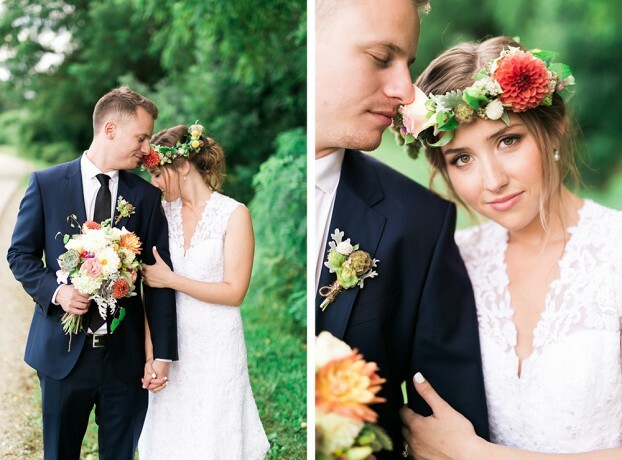 She’s named it Wood Violet, an eco-friendly studio that focuses on locally grown flowers as much as possible, offering wedding flowers and daily deliveries. As we discussed in the interview, Emily hopes to offer gardening classes and floral design workshops at Wood Violet, inspiring people with the beauty of each season. I admire the way she’s playing to her strengths as both a flower farmer and a floral designer, and I admire that her new hybrid business model includes supporting other local flower farmers in her community while still keeping her fingers in the soil. You know, I think Emily has answered the question she posed back in 2011 better than anyone else could have done – and I wish her great success. Before we close, I want to give you the news of the week. 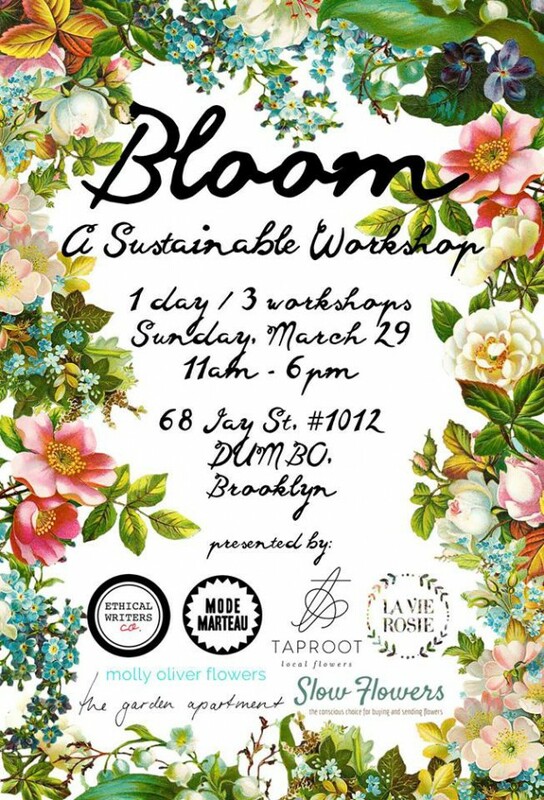 Slowflowers.com has partnered with the Ethical Writers Coalition to present Bloom: A Sustainable Workshop, that will take place on Sunday, March 29th at the Mode Marteau Studio in Brooklyn. Participants can sign up for one or more intimate classes for a hands-on and creative experience in sustainability, and of course, locally-grown flowers. 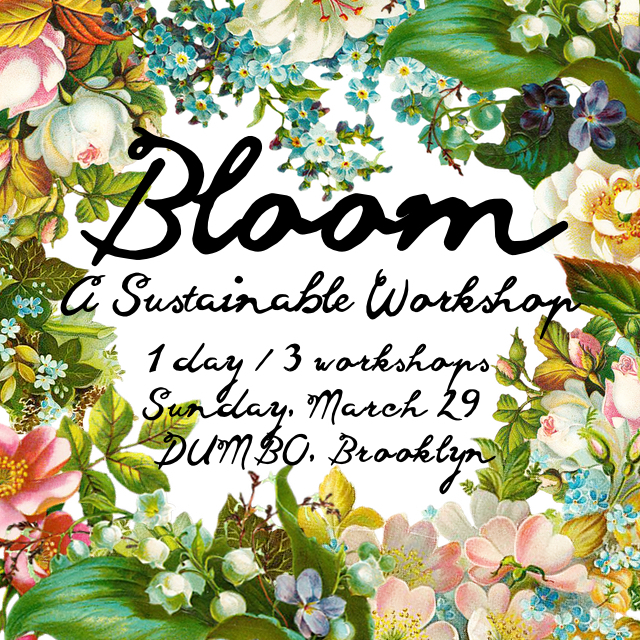 Learn to make your own fresh flower crown, create a perfect bouquet, or plant a DIY a reclaimed vase at three different workshops. Rachel Gordon of Taproot Flowers and Molly Culver and Deborah Greig of Molly Oliver Flowers will teach flower arranging tips & tricks, discuss the importance and sourcing of sustainable flowers, and how to best care for your arrangement. All materials included with the $65 workshop fee. I want to thank the Ethical Writers Coalition for producing this awesome event and for inviting Slowflowers.com to participate. The Ethical Writers Coalition is a very cool group of journalists, writers, and bloggers who seek to support and further ethical and sustainable living online and in print. 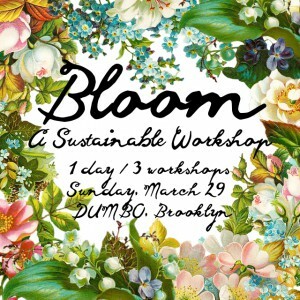 Through my publicists, I met co-founder Alden Wicker of the EcoCult Blog when I was in New York last October – and she attended a SlowFlowers.com gathering where this event idea germinated. After we connected, Alder wrote an insightful post about Slow Flowers, which you can read here. Elizabeth Stilwell, who blogs at TheNotePasser.com, has taken the lead on creating Bloom and I have thoroughly enjoyed working with her on this project – sadly, I can’t attend. But I’m so pleased that Slowflowers.com will be well represented, getting the word out about American flowers and the people who grow and design with them. 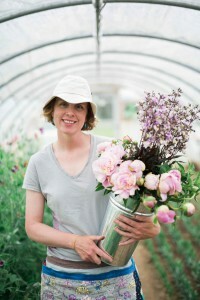 I love how the roots of sustainable living intertwine so perfectly with the American Grown Flower movement. It’s exciting to see the idea of local, seasonal and sustainable flowers move from the alternative/fringe world closer to the mainstream. Last week Grist.org fellow Ana Sofia Knauf published an interview with me and titled it “There’s a Local Flower Movement Blooming,” and I’d love for you to read it. Check out the link to her piece here. Thanks for joining me this week and please return again, as I continue to share insightful and educational episodes recorded exclusively for the Slow Flowers Podcast. Thanks to listeners, this podcast has been downloaded more than 39,000 times. If you like what you hear, please consider logging onto Itunes and posting a listener review. This entry was posted on Wednesday, March 18th, 2015 at 5:53 am	and is filed under American Grown, Blog Posts, Creativity, floral design, Flower Farming, Gardening, General, Plants, Playfulness, Podcast Episodes, SLOW FLOWERS Podcast, Slowflowers.com the Directory of American Flowers. You can follow any responses to this entry through the RSS 2.0 feed. You can leave a response, or trackback from your own site. Debra, you have done it again!! I am so thrilled every time I receive an email from you, I cannot wait to open it and dive in 🙂 This week’s feature of Emily Watson of Stems and Wood Violet MKE really touches my heart. I work very closely with her as we farm in the same community. I am so inspired by her business and how much she has evolved in 7 seasons. Thank you for sharing her story! !